Gautama Buddha, a prince who left his luxury in search of solutions that can cure diseases, sufferings and death. A prince who could have enjoyed his royal dynasty, but he chose the path full of thrown, pain and darkness. At the age of 34, he attained the supreme enlightenment at Bodh Gaya. When the prince Siddhartha Gautama left his kingdom Shakya for discovering solutions to make the life free from sufferings, he was just 29 years old. At Kapilavastu, the Lord Gautama Buddha was grown up and led a family life with his wife and son Rahul till he left for Nirvana. The Ashoka Pillar situated at Kapilavastu marks the latter references about the place. This place is located in the Himalayan ranges of Nepal. Kapilavastu is the district and comes under Lumbini Zone, Nepal. The followers of Buddhism and the tourists want to observe the peace and enlightenment always prefer to visit the sacred place, which is engrossed by the Buddha's deep philosophy. The Shakya means 'Capable', 'Able' in Sanskrit. Shakya capital is known as Kapilavastu located in Nepal in present-day. The famous prince of the Shakya kingdom, Siddhartha Gautama founded Buddhism in 5th century BCE. Today, the administration at Kapilavastu adheres to the Constitution of India. Shakya capital (Kapilavastu) has a rich history and several stories related to faith and believe are narrated here by the locals. The stories are centuries old. Kapilavastu Buddha Mahotsav: Visit the place in between December 29 and December 31 every year. For a Buddhist follower, these three days have a high importance in their life. Stupa Complex: During the early 1970s, this was founded and declared as the archaeological site. Palace Site: During the excavations in 1970's, the leftover of the palace is believed to be of King Shuddhodhan, Lord Buddha's father. Gorakhpur: This town is located 110kms from Kapilavastu. This place has many historic Buddhist sites, Imambara and Dargah. Visiting the city will make you believe in the slogan "unity in diversity". Ayodhya: The city is considered the birthplace of Lord Ram. The city is located at the banks of river Sarayu. It is one of the important holy places of Hindus. By Air: The nearest domestic airport is the Gorakhpur Airport. The Airport is well-connected to Delhi by flights. From the airport, Kapilavastu is just 108kms away. Tourists will find luxurious taxis and private vehicles to reach Kapilavastu from the airport. By Train: Naugarh is the nearest railway station which just 21 km away from Kapilavastu. There are buses and taxis well connected to the railway station. By Road: From Lumbini, Kushinagar and Sravasti, tourists can board the State run private busses or hire a taxi to reach the place by road. 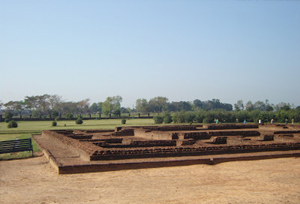 From Lumbini, Kapilavastu is just a few minutes journey compared to Kushinagar and Sravasti.